Exercise is important for kids but if they are feeling tired and sluggish it'll be hard for parents to get them up and moving. Diet plays an important role in energy levels; high quality diets will surely give better results than fatty, sugary food choices. Parents need to provide their kids with a balanced diet rich in nutrients in order for the children to perform at their best. Every diet needs a variety of healthy foods, but active lifestyles require proper fuel. Proteins, carbohydrates, fats, vitamins and minerals all matter -- and kids' dietary needs aren't the same as adults'. Children's specific needs change throughout childhood and can vary from child to child, depending on activity level, overall health status, and other factors. Even gender matters; as kids go through different developmental stages, such as growth spurts, their bodies needs change. For instance, kids aged 6-12 are usually advised to consume anywhere from 1,600 to 2,500 calories daily, but student athletes may need more, as would those in puberty since the rapid changes that come with puberty require additional fuel. In general, though, kids should eat a variety of basic, whole foods, limiting sweets, unhealthy fatty foods, and processed foods, which are likely to contain additives that can be harmful to developing bodies. It's important to note that the sources of proteins, carbohydrates, and fats should be wholesome. There is very little room in children's diets for "junk" foods or empty calories. Good sources of protein include lean meats, fish, egg whites, whole eggs, beans, seeds, nuts, and soy products. Healthy carbohydrates come from fruits, vegetables, and whole grains. Carbohydrates are easily converted into energy in the body, so the recent trend of shying away from carbs is not a healthy one, especially for children. Fat has gotten a bad, yet unfair reputation by many people. Dietary fats are necessary and healthy, as long as they are chosen wisely and used in moderation. Saturated fats (hydrogenated fats and trans-fats) are generally solid at room temperature and should be avoided. Unsaturated fats (monounsaturates and polyunsaturates) usually come from plant sources are and liquid at room temp. The best fats are from unrefined vegetable sources or oily fish. Parents should look for olive oil, flax oil, canola oil, soy oil, extra virgin olive oil, wheat germ oil, and walnut oil when preparing family meals. Dehydration can result in a decreased ability to perform physically, fatigue, and even heat illness. Parents need to make sure that their kids get plenty of fluids, especially plain, clear water. Kids should drink before, during, and after activity, assuring that they'll stay properly hydrated. While water is the best choice, milk, fruit juice, yogurt drinks, fruit smoothies, soups, and even juicy fruits such as watermelon, oranges, and peaches can help to keep kids hydrated. Parents should be wary of beverages labeled as "fruit drinks," however since a quick look at the contents often reveals these drinks to be nothing more than flavoured sugar water. Active kids should be encouraged to carry a water bottle with them as they exercise and play. In order for kids to have steady energy levels, they should be encouraged to eat small quantities over the course of their day. Children are usually not able to comfortably consume large meals, but their caloric needs can be met by taking in a number of healthy snacks to supplement regular family meals. 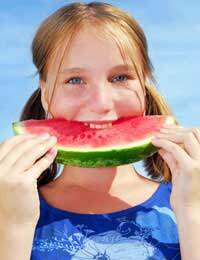 Exercise is good for kids -- activity is vital for healthy bodies -- and exercise requires fuel. Good quality fuel comes from highly nutritious foods like those listed above. So parents needn't worry that their kids are eating too much, just so the foods they choose are good for them.